As long as Jerry Jones owns the team, the Dallas Cowboys will be a team that generates interest. It doesn’t matter if they are expected to be any good; Jones will find some way to make sure the world wants to see his team. But it just so happens that there are expectations for the Dallas Cowboys this season. Will they live up to them? It is certainly too soon to tell. However, if Saturday’s game with the Bengals is any indication, there is a reason for hope. As usual, anything that happens in the preseason has to be taken with a grain of salt. But there were several things that should make Dallas fans happy—and a few that probably left them fuming. Dak Prescott (10-15 for 86 yards and a touchdown) looked as good as anyone could expect at this point in the preseason. His throws looked good. He didn’t try to do anything crazy or too bold. But he moved the chains, made some good decisions, and scored points. In the end, that’s all anyone cares about. Losing Zach Martin to a knee injury wasn’t good, but hopefully, he will not miss any regular season time. 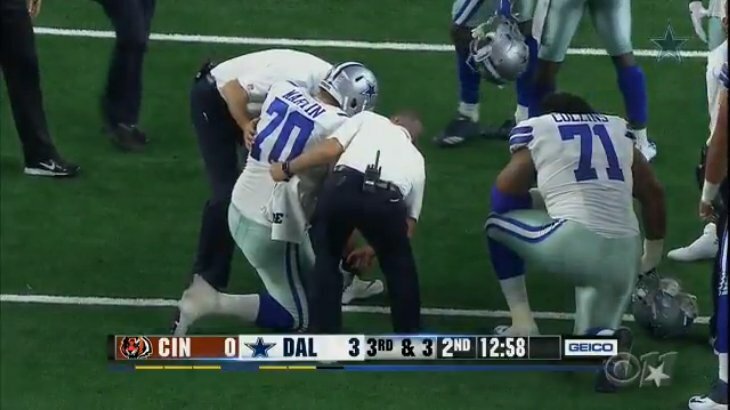 Hyper-extended knees can be annoying, so we have probably seen the last of him until Week One. The first team defense might be pretty darn good this year. They made life hard on Andy Dalton, stuffed the run game, and made some great plays (talking about you, Chidobe Awuzie). However, their second team units were terrible. Cooper Rush has shown promise in the past but looked more like a high school scout team quarterback that was in over his head. Mike White wasn’t any better. Dumb mistakes and penalties by the defense made Bengals QB Jeff Driskel look better than he is. Who else wants to see more of Bengals WR/return man Alex Erickson? Anytime he got his hands on the ball, he made something happen. It may not have been anything huge, but it was a good football play. Should Tra Carson get some more work for the Bengals? Joe Mixon didn’t look impressive with his four carries (eight yards). Giovani Benard only had one carry two yards). Carson had six (24 yards and a touchdown). While he didn’t break a big run, he was the most productive of the bunch. There was one highlight for the Bengals—rookie placekicker Jonathan Brown. The 55-yard field goal he booted through the uprights in the third quarter was a thing of beauty. For those that keep score in the preseason, the Bengals won 21-13. Cincinnati will try to remain undefeated in the preseason when they take on the Bills in Buffalo next week (Sunday @ 4 PM ET). Dallas will look to get on the right side of the scoreboard against the Arizona Cardinals (Sunday @ 8 PM ET).